George Macy was among the most accomplished of reprint publishers in the 1930s and onward, braving the U.S. depression with a trio of subscription-based series from expensive, limited editions to dollar books. His canny sense of promotion and advertising and use of direct-mail for both promotion and sales was innovative and led to the success of all three series, which persisted to 1970 when the firm, George Macy Companies, was sold by his family. The purchaser, Boise-Cascade Co. subsidiary publisher Communications/Research/Machines (CRM) continued to publish Macy’s series after the purchase. Macy established the trade publisher Macy-Masius in 1923. 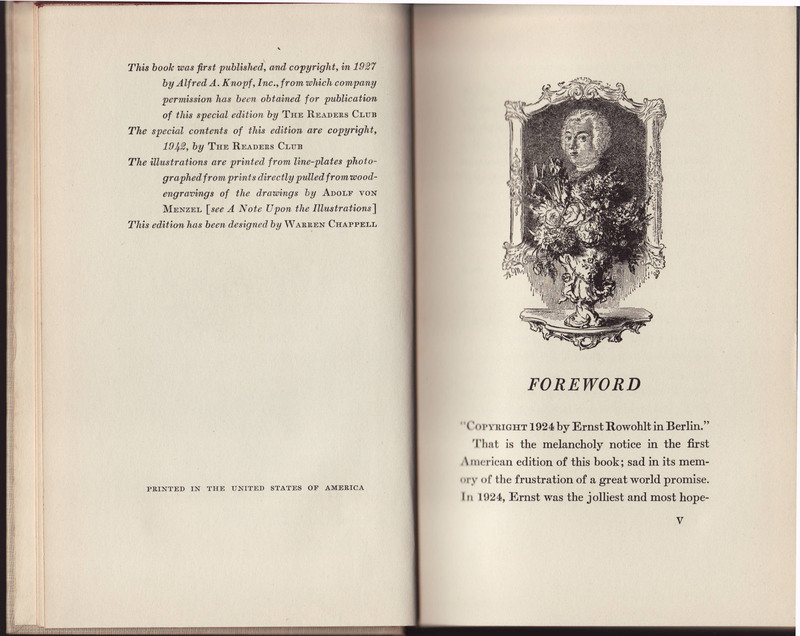 The firm issued the series called An American Bookshelf beginning in 1927. The series was edited by Mark van Doren and sought to publish under-appreciated books, “racy and entertaining, but little known” to the U.S. reading public. Macy, apparently tiring of the trade book business, sold Macy-Masius to the Vanguard Press in 1928. The An American Bookshelf series was very limited (six titles) but seems to have set Macy to thinking about the prospects of the reprint series. An American Bookshelf was published within the dollar book, sold-at-stores model. Macy’s innovation would be a high-priced, high quality, highly promoted subscription-based series, paid for in advance by subscribers (the Limited Editions Club). Its success would lead to additional series (at lower cost, and also sold in retail stores) from the 1930s through to the 1970s. Macy founded the Limited Editions Club in 1929. The series included reprints illustrated and finely produced. They were limited to 1500 copies, signed by the author or artist and sold by subscription ($108 per year, $10 per book). The first title, Gulliver’s Travels, debuted on October 23, 1929, the day stock markets in the U.S. collapsed. Despite this dire turn for the U.S. economy, the 1500 subscriber limit was reached by the end of 1929. Macy developed the Heritage Press in 1935, which published classics similar to those in the Limited Editions Club but at a cheaper price. Heritage Press titles soon became the core of the Heritage Club, a subscription-based plan whereby a commitment to purchasing a set number of titles per year lowered the price of the books. The subscription was $27 per year for 12 books, $2.25 per book. The Readers Club series titles were first issued in 1941 and included reprints of titles Macy and his board of judges (Sinclair Lewis, Clifton Fadiman, Carl Van Doren, and Alexander Woolcott) deemed worthy of more attention than they received when originally published. The subscription required one to purchase at least 6 titles a year for $1 each. The books were also sold in stores for $1.50. This “cheap” series mimicked (in price point and in content) Macy’s earlier An American Bookshelf series, first published in 1927 when Macy was heading up the publisher Macy-Masius. 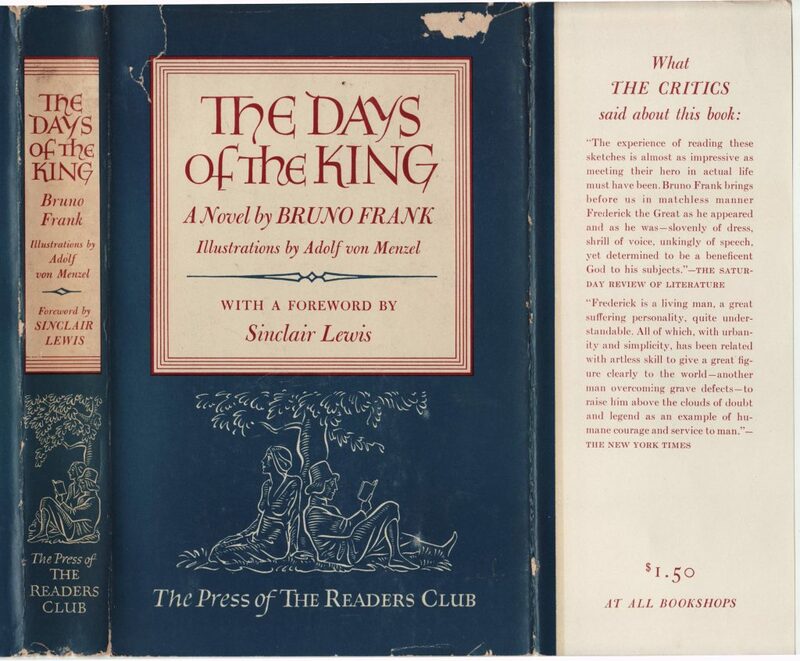 Dust jackets for the Readers Club were of a common design. Initial jackets emphasized the text on the front of the jacket, but by the mid-1940s the jackets had been redesigned, the illustration of a genteel couple reading under a tree expanded to fill a larger space on the jacket front. 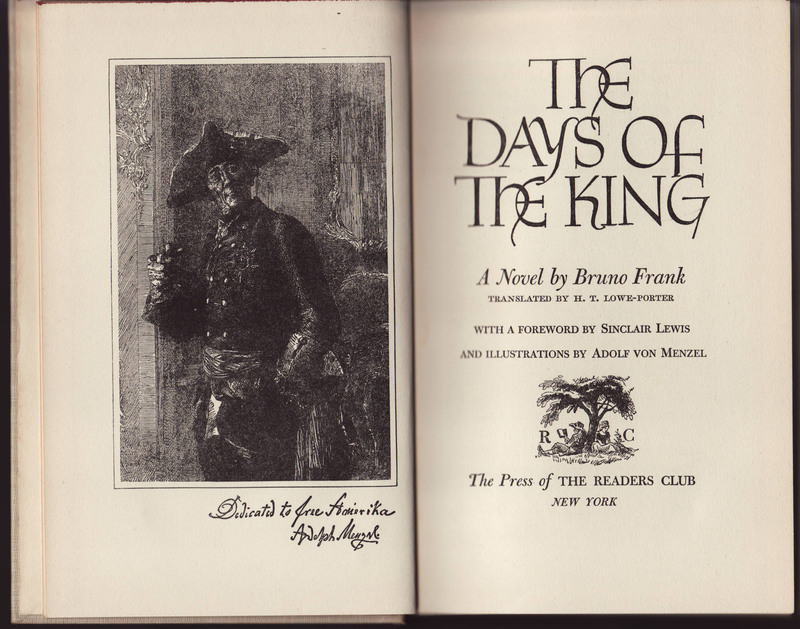 This copy of Bruno Frank’s The Days of the King was originally published in 1924 in Germany by Ernst Rowohlt, and in the U.S. in 1927 by Knopf. The Readers Club reissued the title in 1943. It seems that Readers Club books seldom if ever included a printing date in their reprints, thus the copyright date is the only date in the books, regardless of when they were printed. The front jacket flap includes a few comments by critics about the book. The retail price of $1.50 is included at the bottom of the front flap. Subscribers got the book for $1 upon committing to 6 titles per year. The price is repeated on the rear jacket flap. The idea was probably to remind subscribers that they were getting a special deal (at 33% off). 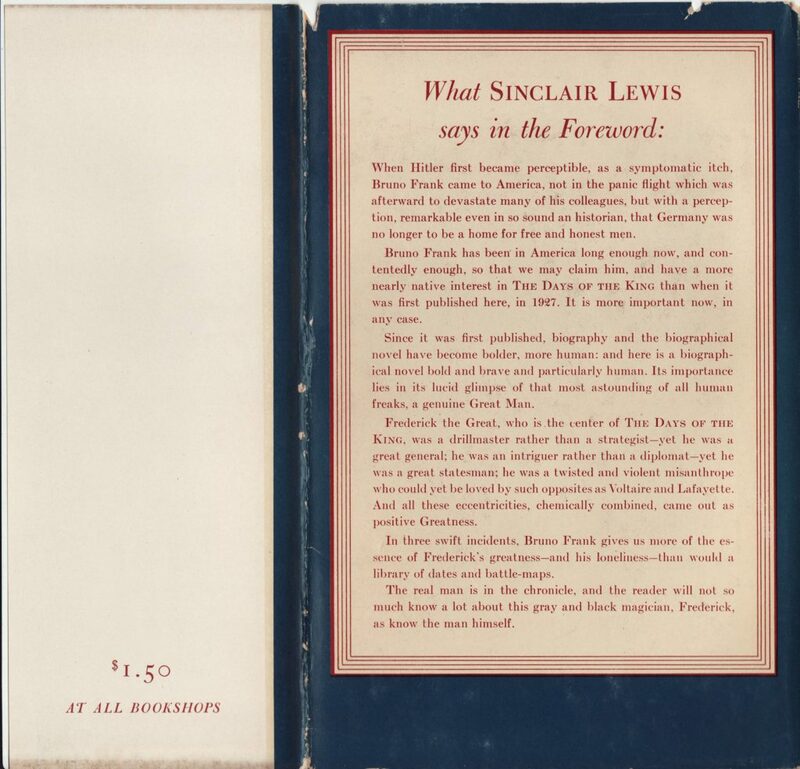 Sinclair Lewis, one of the four series judges, wrote the forward for this book and highlights from the forward are included on the rear of the jacket. Bindings are solid, tan cloth with black and gold typography and decorations. The series name is prominently included on the front of the book. 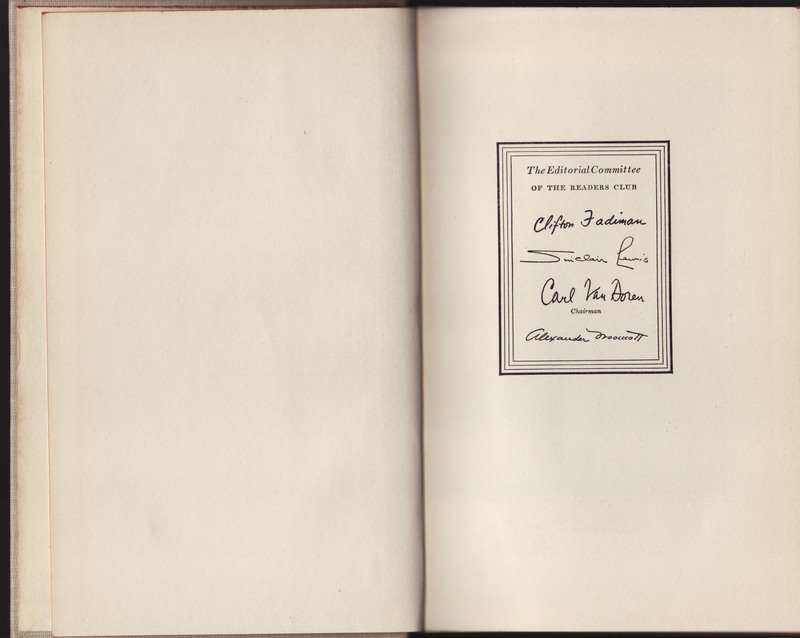 Instead of a half-title, a series of signatures by the editorial committee for the series is included in the book, prior to the title page. The title page is faced with an illustration. 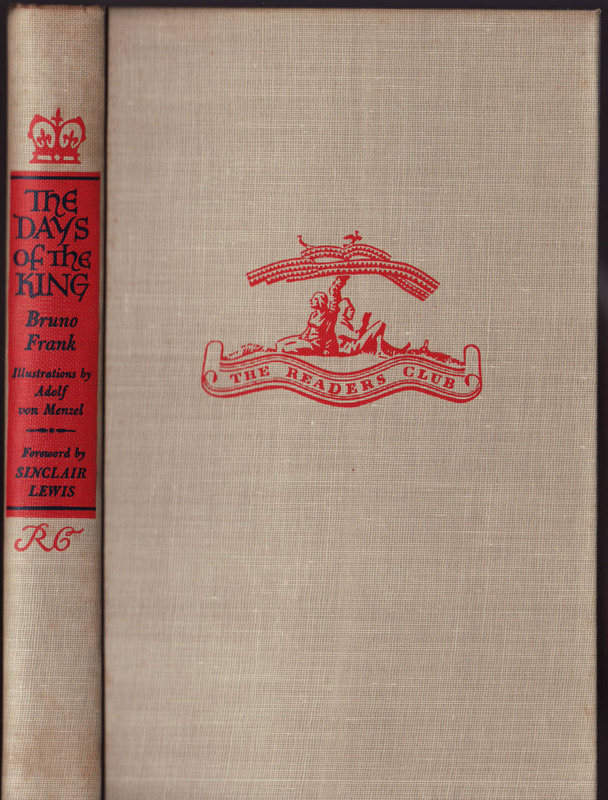 The Readers Club logo is placed over the publisher’s imprint on the title page. The extensive copyright page includes original publication information, information on the Readers Club title, information about the illustrations and an indication of the book designer (Warren Chappell). The book was printed in the U.S.